1) Which heat setting am I supposed to use? 2) Is that type of oil splatter normal or should I try using a different oil, and if so, what oil? 3) Should oiling the meat instead of the pan help the problem? You need to realize that oil doesn't splatter, water does. In fact, you could heat oil until it catches fire without any mayor movement. But the moment water reaches the oil, which in a hot pan is way beyond the boiling point for water, it will instantly turn into steam, expand and pull oil drops with it. So apart from lowering the heat - which is not what you want to do for a well-seared piece of meat - you want to make sure your meat is as dry as possible on the outside. Kitchen towels to blot off your meat would be my first choice. In cases of wet marinades, remove the marinade and either grill your meat or lower the heat of your pan a bit. But not because of splatters, but because the marinade may burn. The more oil you use, the more can splatter. A thin layer, possibly even just brushed on with a silicone brush will suffice in most cases. You may also oil the meat instead of the pan. For the type of oil, just stick with an oil that can handle high heat (save your extra virgin olive oil for a salad), canola is fine and so is peanut and some others. And finally, there are splatter-guards on the market that can catch those propelled oil droplets. They are made from a fine metal mesh and placed on the pan like a lid. My prefered "hack" is using an inverted round cooling rack with a single layer of kitchen towel for these "will certainly splatter" cases. It lets steam escape better than many of these fine-mesh splatter guards and the towel absorbs moisture, which then can't drip back into the pan. Besides the rack can go in the dishwasher while at least some splatter guards need hand washing (if only because the mesh tends to catch debris from the water). 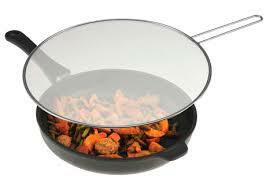 The "lid" is a thin wire mesh that allows steam to escape and keeps most of the oil in. Get a griddle pan. Not only will it stop splashes from the water / juice as it is trapped in the grooves, it caramelises the meat and leaves a beautiful criss-cross pattern if you turn it 90° as you cook it. Make sure you season the steak well too. Bonus: deglaze the griddle with Jameson whiskey, add the juice to reduced cream & pepper for the nicest steak sauce in the world. yes, if it looks wet on the surface then it will splatter. One of the best investments I have ever made in the kitchen is to buy decent kitchen towels that don't turn to slush. I use them to thoroughly dry a steak or the skin side of a fish so that it can be brushed in oil cooked on a medium heat and crisp up nicely rather than char and splatter of the highest heat. Not the answer you're looking for? Browse other questions tagged oil steak stove frying-pan or ask your own question. Why dry steak/meat/chicken/fish before cooking on a stove? How reliable is determining cooking oil temperature with a thermometer?